Every Child Dreams of Meeting Santa! 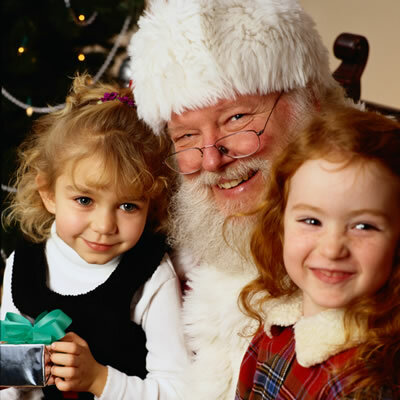 Your child will never forget visiting the Magical Kingdom where Santa lives and the thrill of meeting him in person! Santa will be on hand every night from Nov. 16 - Dec. 25th, in his workshop at Kringle's General Store from 5:30pm-10:00pm to greet guests and create moments of magic for "kids" of all ages. Let our friendly elves capture that precious moment of your child with Santa in a quality photo package that you and your family will treasure for years to come! Our state of the art photo system provides high quality photos that are sharp, vivid, fade restistant, and even waterproof! Santa and his elves have worked hard to provide you with quality photos at a fraction of the cost of mall photos. In fact, the savings over mall photos will more than pay for your family's trip through Santa's Magical Kingdom! For just $16.95 you'll receive a 15 photo package that includes one 5x7, one 4x6, two wallets, four mini-portraits, and seven thumbnail sized photos suitable for keychains, jewelry, and ornaments. You can purchase additional photo sets for grandparents and family for just $6.95 each. An 8x10 photo may also be added to the set for only $6.95. Credit/debit/cash accepted. Plus, you're free to make copies of the photos! Unlike Santa photos taken at the mall, we don't copyright the photos we provide to you. This means you're free to make reproductions and enlargements/reductions any time and any where you choose. This is especially important for all of you "scrapbookers" out there! Please be advised that photos with Santa are on a first come, first served basis with a limited number that can be taken each evening. For that reason, you may prefer to visit Santa's Magical Kingdom MON - THURS early in the season when Santa can spend more time with each child. In order to keep the process running smoothly for all guests, we regret that we may not allow guests to take their own photos.